Firefighters and civil security officers work at the scene of a fatal military plane crash in Boufarik, near the Algerian capital, Algiers, Wednesday, April 11, 2018. Algerian emergency services say 181 people have been killed in a military plane crash and some survivors have been rescued. An Algerian military transport plane crashed Wednesday just after taking off from an air base south of the capital, Algiers, killing 257 people, according to a statement from the Ministry of Defense. The Russian-built Ilyushin Il-76 was headed to the southwestern city of Bechar when it crashed just outside the Boufarik military air base in a farm field. The dead include soldiers and their family members. “The number of martyrs has risen to 247 passengers and 10 members of the crew, most of whom are members of the army as well as their families,” the ministry statement said. There was no immediate information about the cause of the crash. The military added that Gen. Gaid Salah, head of the army, had gone to the site and ordered an investigation into the crash. Television images showed black smoke billowing from the crash site, some 20 miles south of Algiers on the way to the city of Blida. Rescue personnel moved around the shattered plane. Later images showed most of the plane’s fuselage intact with the tail sticking out of the field. The plane was scheduled to stop in the remote town of Tindouf along the Moroccan border, site of the sprawling refugee camps for Western Saharans that have fled the decades-old conflict with Morocco. Djamel Ould Abbes, secretary general of the ruling FLN party, told Ennahar television that 26 of the dead were members of the Polisario, the armed group fighting Morocco’s control over the Western Sahara region. 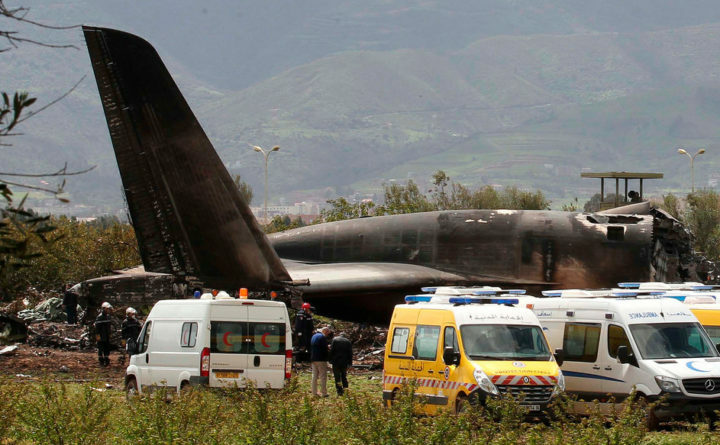 In February 2014, another Algerian military transport plane, this time a U.S.-built C-130, crashed into a snowy mountain in eastern Algeria killing 77 people with just a single survivor. Some of the victims of that crash were civilians as military dependents often used the planes to travel as well as troops.